The high temperatures of the day radiated off the stone avenues in the coastal city of Dubrovnik, Croatia. It was early September and the streets were sweltering and crowded with sunburnt tourists congregating to explore the 7th century town overlooking the sparkling Adriatic. But despite the hordes, I was determined to find the spot where the shorn and naked Cersei Lannister endured her “walk of shame” filmed for the popular TV series Game of Thrones. It turned out earlier I had unknowingly admired the Jesuit Staircase where the controversial atonement scene had been filmed. Being an avid fan of the show and having seen the site I was content to stroll the passages becoming a part of the swarming masses. Impressive is the word that comes to mind in describing this medieval gem crowned “The Pearl of the Adriatic.” The pristine city is adorned with terra cotta rooftops and limestone buildings of varying architectural styles including Gothic, Renaissance, and Baroque that line the walkways dating to the 13th century. It was hard to imagine that during the Serbian Croatian War the city had been bombed but fortunately it has recovered and today this national treasure has been recognized as a UNESCO World Heritage site. For us the best way to enjoy the town was to stroll its meandering walkways with no set plan allowing the paths to lead us in discovering private terrace gardens, tucked away bars, and small galleries. The evening temperatures were pleasant to explore the well known sites that allowed for time and place with the day trippers packed off back to their cruise ships. We woke up early to take the popular self guided tour around the city atop the ancient ramparts to avoid the heat and crowds. It was a good strategy again allowing us time and room to admire the sea and the unsurpassed views with the morning light making for a photographer’s dream. The former wealth of the noble settlement is apparent and its power was derived from its strategic position on the Dalmatian coast and its position gave it access to important shipping routes that allowed for trade far and wide. Their fascinating history is one of invasion, occupation, and war. Beginning in the 7th century they were attacked by the Slavs. They then merged with the Byzantine Empire in the 9th century where they became increasingly prosperous, so much so that the Venetians fearing their growing power attacked, and they came under their rule from 1205-1385. During this time the old city was built in the 13th century and even boasted a pharmacy that still stands today and an orphanage dating to these times as well. The city was raised by an earthquake in 1667 weakening it so much that Napoleon was able to take the city in 1806. After Napoleon was ousted they were once again swallowed up by the Austrian-Hungarian Empire in 1815. Following World War I Croatia became part of the Kingdom of the Serbs until after World War II, they then joined the other Balkan states to become Yugoslavia. And most recently during the Serbian Croatian war they were brutally besieged for seven months and the old town was badly damaged, but today it has been restored to its former glory attesting to the indomitable spirit of its people. 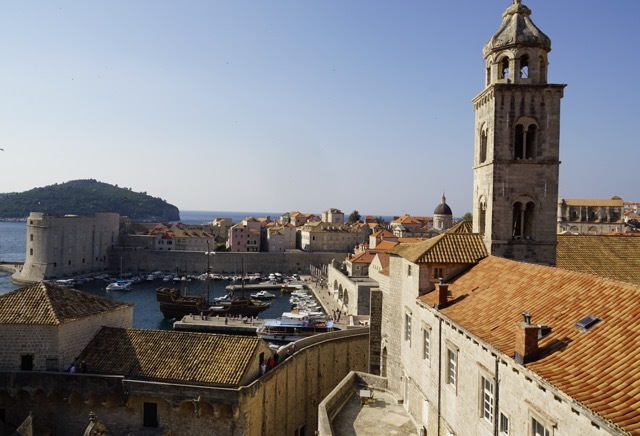 The culinary scene in Dubrovnik focuses on seafood and seasonal vegetables from the region. The typical restaurant menus are very good, although not particularly innovative, with the food prepared to allow the flavors to shine through unhindered by sauces and spices. One exceptional restaurant for us was the Bota Sare Oyster and Sushi Bar. What enticed me to this restaurant was a sign posted outside that they served the famous Mali Ston oysters that I had only read about. Oysters and sushi top the list of my favorite foods so it was a no brainer. Their prime location across from the famous 12-14th century Romanesque Cathedral of the Assumption offered a welcome respite from the droves but more importantly served up an outstanding Adriatic and Japanese fusion menu. We partook of the reputed Mali Ston oysters and sushi and paired the salty goodness of the succulent mollusks with a well known white wine called Pošip from Korčula. What a way to top the day reveling in the bounty of the sea while marveling at the architectural mastery of this gleaming city. 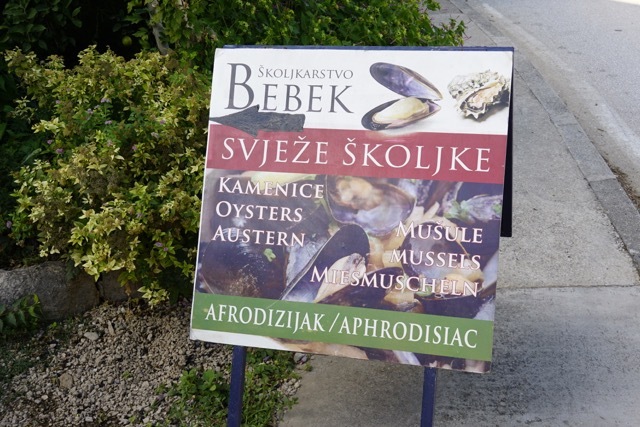 After having tasted the lauded Mali Ston oysters the night before in Dubrovnik Franz and I just had to venture out to the source to taste some more of its salty goodness. So we boarded a local bus in the morning out to the Pelješac peninsula about an hour away and spent the afternoon exploring the bay and swimming in its temperate waters. We arrived just after the bus tours had left for the day so the village was quiet and relaxed. The idyllic Mali Ston sits at the edge of the clear waters of the bay of the same name and is really only a small assortment of modest houses and a few restaurants with a long ago abandoned castle that towers over the town. Its shores are lined with an assortment of boats of all sizes and shapes and is littered with plenty of oyster cages dangling alongside the water craft. The oysters have been farmed here since ancient times with the town founded in 1335 and the port built later in 1490. There are a series of fortifications of walls and towers constructed as defensive measures to protect the nearby Dubrovnik with a 5 kilometer wall joining the nearby Ston. And every September runners from around the world come to participate in the Stone Wall Marathon that follows these long ago defenses. The restaurant of our choice was the Kapetanova Kuca that has a enviable seaside location with a harbor view of the calm waters that nurture the oysters to delectable perfection. 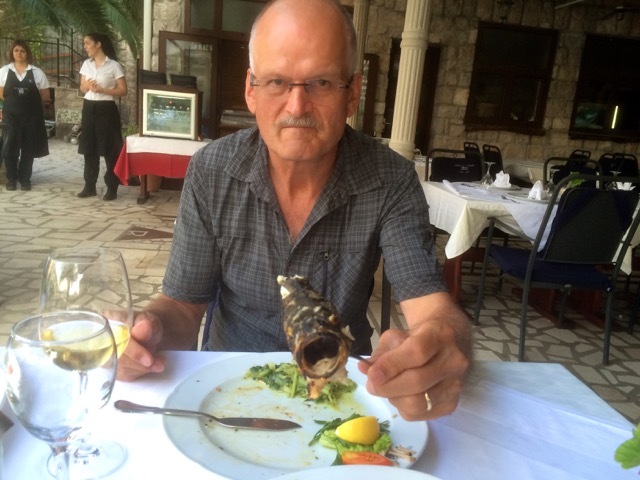 We feasted on them of course and chose a beautiful grilled fish with a side of black squid risotto and paired it with several glasses of Pošip from Korčula. Our meal ended on a sweet note of Mali Ston cake called Stonski makaruli. We were in luck and had the restaurant almost to ourselves and basked in the attentive Dalmatian hospitality. This is one place I will come back to again and again.